Present earlier in the year at the Team World Cup in London and more recently at the Tarragona 2018 Mediterranean Games, alas there were no medals for Egypt’s Farah Abdel-Aziz; however, on Monday 9th July, there was more than cause for celebration. 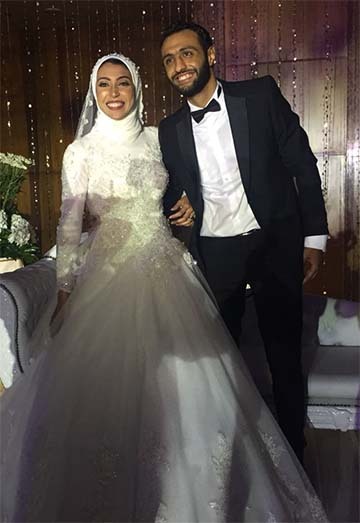 She married Assem El-Gendy, a sportsman from a different discipline; he excels in the art of basketball. A splendid occasion, the wedding brought together not only the families of the bride and groom; it also brought together the Egyptian table tennis family. Notably, also attending the occasion were members of the Egyptian Women’s Team. Dina Meshref who had won the Women’s Singles title at the recent Mediterranean Games and is very much the pride of her country, was present, as was expectant mother, Nadeen El-Dawlatly alongside Reem El-Eraky, Galila Nasser and Yousra Helmy.